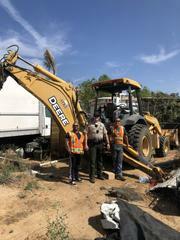 On Friday, August 24, 2018, Jurupa Valley Deputies tracked a stolen John Deere tractor, valued at $80,000, to a parcel of undeveloped land on the 8400 block of 58th Street, in the City of Jurupa Valley. Atkinson Construction Company owns the tractor and it was reported stolen sometime Thursday night, August 23, from a construction site. Deputies investigated the theft that led them to the location where they authored a search warrant for the property. 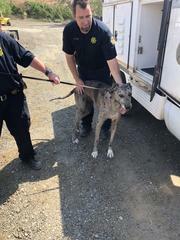 Deputies recovered the tractor on the property along with a missing family pet, a Great Dane, named “Sadie.” Riverside County Animal Control confirmed Sadie had been away from her rightful Jurupa Valley family by scanning her microchip. Sadie’s family stated they suspected someone stole her from their yard approximately two years ago and they have been looking for her ever since. Sadie’s owners mentioned that it is their daughter’s 5th birthday and she is excited to have her best friend back! 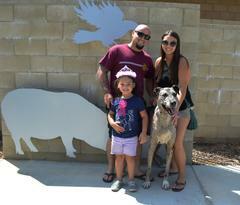 Animal Control took custody of Sadie and she was reunited with her family in time for their daughter’s 5th birthday (click on the attached link below to view the family reunion with Sadie). Atkinson Construction Company was thrilled to have their equipment back! 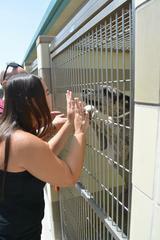 A 48-year-old Jurupa Valley resident was identified as a suspect. The suspect has yet to be arrested. The investigation is on-going. Anyone with further information is encouraged to contact Deputy Newman #3555 from the Jurupa Valley Sheriff’s Station at (951) 955-2600. The Riverside County Sheriff’s Department would like to thank the Riverside County Animal Services for their efforts in this investigation.